To effectively and efficiently implement an organization-wide strategy requires many factors come into alignment before successful implementation can occur. First, an accountability model must be clearly defined and embraced for each element of the strategy. Who owns each objective in the plan? Who is responsible for each of the organization’s strategic initiatives? Who is responsible for defining, collecting and reporting on the organization’s key performance indicators? 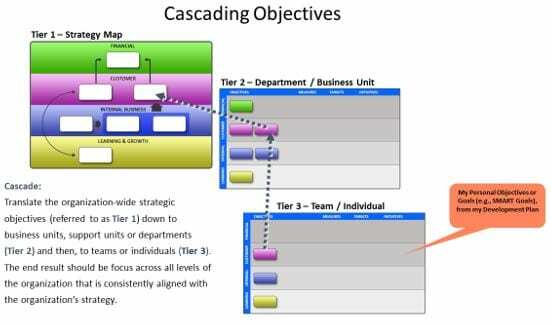 Second, the organization-wide strategy must be effectively cascaded down into the business units, support functions, teams and individuals down through the organization. Third, adequate resources (time, budget, skills and capacities) must be available. It does great harm to an organization to spend value time and money to develop a going forward strategy, only to find out it does not have sufficient resources to implement the plan. Fourth, managing change on a consistent and professional basis is vital. Change management is the primary responsibility of the executive leadership team and involves the understanding and managing of internal and external change and understanding the influencers of change. However, as the process of implementing change becomes a continuous effort growing in scope and complexity (both strategically and operationally), a set of change management roles begin to emerge that require recognition, training, and development. Sponsors—the leaders, executives and managers with the authority to make changes in the current strategic direction, the organization structure, and/or the processes required to implement and manage it. Champions—the individuals throughout the organization that identify strongly with the need for given changes. They are self-appointed and need the unwavering support of management to be recognized by other managers and staff members. Change agents—the individuals responsible for any part of the implementation process. They can also be sponsors and champions of change, as well as targets of change themselves, but primarily they understand change, know how to manage change, and deal with the people involved in the changes they undertake. Targets of change—the people within the organization directly impacted by implementation of the operating plan and the changes it brings about. Those who will be affected must be identified to assess how they will be affected, what changes they can expect, and why. Since people vary dramatically in how they react to change, their potential for resistance needs to be understood and dealt with constructively. “Strategies most often fail because they aren’t executed well. Things that are supposed to happen don’t happen. Either the organizations aren’t capable of making them happen, or the leaders of the business misjudge the challenges their companies face in the business environment, or both” (Ibid, p.15). An organization can execute only if the leader’s heart and soul are immersed in the company…The leader is the only person in a position to achieve that understanding. And only the leader can make execution happen, through his or her deep personal involvement in the substance and even the details of execution” (Ibid, p.24). Another key insight comes from Darryl Conner in his work on the notion of a “Burning Platform.” Conner maintains the key to successful implementation of change is for the team to conclude that failure to execute the strategy (or make the change) is better than the status quo. Strategy professionals have an important role to play in helping top executives and their leadership teams understand and embrace these fundamental requirements.